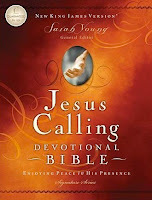 This past summer, I briefly reviewed the devotional book Jesus Calling by Sarah Young. In that post, it was demonstrated that Young claims to have received her messages, her devotions, directly from God. From Young's own words, we saw that she admitted to practicing visualization, a mystical practice that is supported nowhere in Scripture. We examined her descriptive experiences with the "Presence of God," noting that even her own "conversion" story is wrought with warm mists and hug-like feelings, but is absolutely devoid of any mention of sin, conviction, repentance or full trust in the Lord Jesus Christ. "One night I found myself leaving the warmth of our cozy chalet to walk alone in the snowy mountains. I went into a deeply wooded area, feeling vulnerable and awed by cold, moonlit beauty. The air was crisp and dry, piercing to inhale. Suddenly I felt as if a warm mist enveloped me. I became aware of a lovely Presence, and my involuntary response was to whisper, "Sweet Jesus." This utterance was totally uncharacteristic of me, and I was shocked to hear myself speaking so tenderly to Jesus. As I pondered this brief communication, I realized it was the response of a converted heart; at that moment I knew I belonged to Him." Several things jump out at me here. First of all, I did not know that Jesus was a warm mist. Intersting. Notice that shefeltthis supposed misty presence. Then, after muttering a blasphemous phrase that is common among unregenerates, she decided that she was converted. There is no talk of conviction or acknowledgment of sin, nothing of repentance, nothing of a crucified and risen Savior. In short, there is nothing indicative of a biblical conversion. Of course, I can make no unequivocal claim that Young is not actually saved, and that is not what I am doing here. But her account of her conversion, in combination with the presumptions and claims made in her book, are those of a confused believer at best, and a deceived unbeliever at worst. In either case, the Christian ought to either completely avoid Young's works (which would be my recommendation), or exercise extreme caution when reading, recognizing that her words are not the words of Jesus as she claims. "One morning as I prayed, I visualized God protecting each of us. I pictured first our daughter, then our son, and then Steve encircled by God's protective Presence, which looked like a golden light. When I prayed for myself, I was suddenly enveloped in brilliant light and profound peace. I lost all sense of time as I experienced God's Presence in this powerful way." Occult practices intangible images are brought into (physical reality) the material world, our 3rd dimension, by a number of ways. The attainment of this experiential knowledge (gnosis) leads to a self-realization . It has been said by occultists it lead's one to the mastery of spiritual technology and the attainment of psycho-spiritual powers. The belief is that energy follows our thought. Our mind and thoughts produce energy, which begins to be birth in the spiritual realm first and then is reproduced in the natural. As the image we hold is incubated in thought it becomes birthed in the physical material world. Everything is first spiritual then physical. They claim this is how God created, he first had the image and then spoke it .This is clearly Christian Science and mind science also found in eastern ways of philosophy and metaphysical thought. Mental imaging is a common practice in the occult. One holds an image in their mind and puts in the details like coloring in an outline. As they envision it each day, meditate on it becomes clearer and will come to pass. This technique is now used for healing traumas that are emotional, cancer and other diseases. One sees the cancer or disease being fought and conquered and essentially leaving. What the new age is teaching is that one holds an image in their mind and goes in to experience it or uses it to change their reality. This is spiritual manipulation for power and healing. The Bible calls this sorcery, divination and vain imaginations. I have yet to find the passage in the Bible which describes one's conversion as a feeling of being enveloped by a warm mist. I am also searching in vain for the instance when Jesus taught His disciples how to experience Him through visualization. These things are not there. Why? Because they have no biblical basis and are, quite bluntly, occultic practices. Sarah Young may have heard from somebody, but she has not heard from God. "During that same year I began reading 'God Calling,' a devotional book written by two anonymous 'listeners.' These women practiced waiting quietly in God's Presence, pencils and paper in hand, recording the messages they received from Him (page xi)." So here we learn that Sarah Young admits to being influenced by women who entered altered states of consciousness in order to "hear" from God. "Listening Prayer," also known as "contemplative prayer" or "centering prayer" is when one stills himself, both mind and body, empties his mind and waits quietly to "hear" from God. Tell me, if one is reading God's Word, and if one is allegedly waiting to hear from the God of the universe, why would that one need to ask that same God for protection from deception? Answer: because this is not how God speaks to us today. If you are waiting to "hear" from God outside of Scripture, then you are telling God that His Word is not enough for you. Moreover, you are opening yourself up to "hear" from deceptive and lying spirits. "If you want to hear from God, read your Bible. If you want to hear audibly from God, read your Bible out loud." (I believe that quote is from Justin Peters, but I don't have an online source for it). Though not included in the instructions above, oftentimes this type of so-called prayer involves repeating a word or phrase - a mantra - over and over again as a means of stilling and emptying the mind. This is the process of New Age or Eastern meditation. And, before someone argues that they're using the name of Jesus as their mantra, ask yourself: does tacking the word "Christian" onto the word "murder" make it sanctified and acceptable? An extreme example to be sure, but the logic is the same. Just because you call something "Christian" doesn't make it so, especially when the original practice is directly opposed to biblical Christianity! To that point, what does the Bible say about how we are to pray? How gracious of our Lord to offer us a clear teaching of how to pray! With the exception of places like Deuteronomy 18:10-14, where Scripture is condemning practices such as divination and contact with spirits, one cannot find any biblical basis for a "Christian" version of channeling - let alone allegedly channeling Jesus Himself! To suggest such a thing is an abomination and a lie. These "listeners" who wrote God Calling and who so heavily influenced Sarah Young were engaged in a practice of the occult. No doubt the Enemy has utilized a thin, "Christian" veneer over this deception in order to draw ungrounded believers into a dark, dangerous web of deception. Some will think this is "like God speaking to them?" Only if they are reading the Scripture portions of this book! I can agree only with the last sentence of this paragraph, "At its worst it could lead someone away from what the Lord is actually speaking to them" and then I still must add to it, that these devotions will lead away from the true triune God and into a walk with a deceptive, lying, false "angel of light." 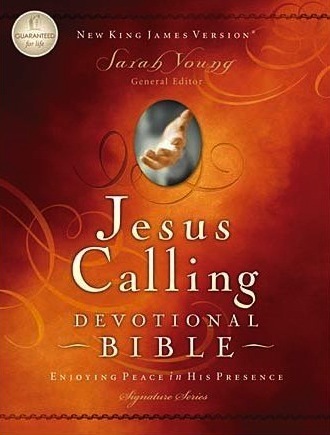 It is my fear that, just as Jesus Calling was a runaway success, this newest "devotional Bible" will be resting in a brightly colored package under far too many Christmas trees of undiscerning Christians. If Scripture is not enough for you, then I suggest you take it up with God Himself. But do not allow yourself to be deceived into thinking that someone who once took an experiential nature walk is now hearing personally from the Lord Jesus Christ. If you desire true communion with God, engage in biblical prayer and then open His Word and read it, study it, and reflect upon it. God has not made Himself inaccessible. On the contrary, He has been gracious enough to grant us sufficient knowledge of Himself through His great Word, the Bible. How dare we shun such a great gift.